Politico's "Leaning Out: How Michelle Obama Became a Feminist Nightmare" is exactly the kind of piece a media organization puts out to get people angry. The title manages to squeeze in not one but two hot internet hype phrases: a reference to Sheryl Sandberg and "feminist nightmare." Too bad the substance doesn't live up to the hype. Michelle Cottle's actual article on Michelle Obama has no new information. She's used the peg of the First Lady's new education initiative (a development that's not so much of a surprise as some would like to paint it as) to breakdown the discussion that's centered around Michelle's style of being the First Lady since Obama started campaigning for the 2008 election. Nothing Cottle presents is something we haven't heard before: We know that being a First Lady is always a strange position to be in. We know that Michelle definitely didn't even want to be First Lady in the first place. And we know that as a black woman, Michelle has had a hard time convincing white America to like her. So enough already with the pining for a Michelle Obama who simply doesn't exist. The woman is not going to morph into an edgier, more activist first lady. The 2012 election did not set her free. Even now, with her husband waddling toward lame duck territory, she is not going to let loose suddenly with some straight talk about abortion rights or Obamacare or the Common Core curriculum debate. Turns out, she was serious about that whole "mom-in-chief" business—it wasn't merely a political strategy but also a personal choice. 2. As a black woman, she can't. Most delicately, there's the defense that Michelle Obama must tread lightly to avoid being stereotyped as an Angry Black Woman—an image critics were clearly itching to saddle her with early in the 2008 campaign. But Cottle actually argues against the premise: FLOTUS is actually doing exactly what she wants to be doing. "Once Barack hit the big time, the pair more or less transferred this domestic dynamic to the White House, where the spotlight was scorching but at least the support systems were better," Cottle writes, referring to their shift as a campaign couple to a presidential couple and the "concessions" that Michelle made to help her husband win. "Whether other women regard this as a cop-out or a brave new model of empowered womanhood likely depends on both their politics and their feelings about the first lady herself." "But it is what it is, just as Michelle Obama is who she is—and to some degree always has been," she adds. By focusing on education and health, Michelle is pursuing her own interests. But she likely would punished if those interests were considered less that appropriate for a first lady, and let's not pretend we live in a society that would be accepting of a black first lady who was more in the vein of Hillary Clinton. We were barely tolerant of Hillary Clinton's gung-ho, policy-oriented style of being a First Lady when her husband was in office. We were barely tolerant of it when Clinton was running for president on her own merits. Why would anyone think that our country has come far enough to be okay with the same attitude from a black first lady? So for me, first lady Obama is navigating multiple spaces and in some ways it has retained its bigness and its value and in other ways it has diminished. Most importantly for me, I think there was an active, purposeful – and I think she has said it to us – desire to remove from public space the idea of the black woman who emasculates her husband. That she very actively and purposefully moved back from the partnership model that we saw initially – not only partnership model but actually in active critique of her husband. Perry went on to discuss the Obamas decision to purposefully change the narrative of their family between the 2008 primary and general elections, and also touched on Michelle's body, which has been the subject of much debate. As Cottle includes in her piece, some would say that the focus on the First Lady's clothes and arms has been an unwelcome distraction from all the good she could be doing with policy. But to Harris-Perry, the First Lady's focus on obesity politics while wearing the clothes she wears demonstrates "an unwillingness to shrink" by "inviting the scrutiny of the body." Cottle's piece essentially argues the same point. "You've got to be real here. This is America. Our history demands strategy—and grace and finesse. It's a miracle to me that she's been able to do it as well as she has," Rebecca Walker told Cottle of the difficulty Michelle has as the first black First Lady. By including quotes from many previous articles written on the topic, Cottle is attempting to acknowledge that she's not the first to opine about Michelle Obama's vision of First Ladyhood while acting as if there's a new peg to this over-churned story that entirely changes the narrative. More interesting would have been a piece like the one the New York Times' Jennifer Steinhauer published last week (that Cottle cites) about Michelle's education initiative, which provided nuance in explaining exactly what's notable and what's not notable about FLOTUS's decision to get involved on this front. But back to Cottle. 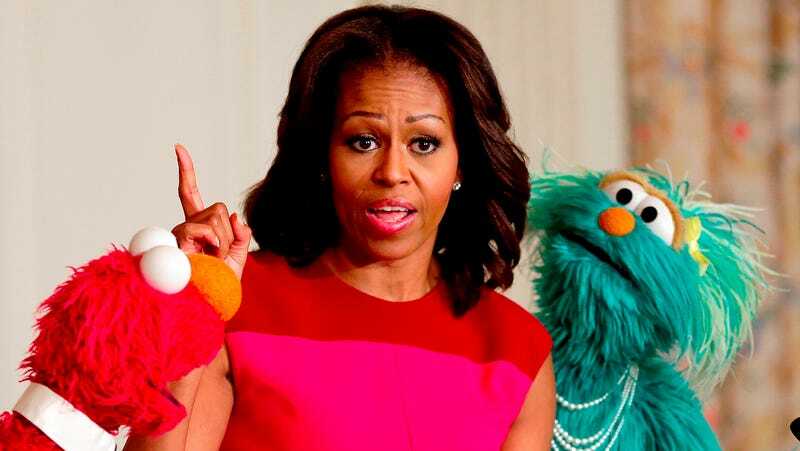 "So enough already with the pining for a Michelle Obama who simply doesn't exist," she writes. "The woman is not going to morph into an edgier, more activist first lady." But why the implication that there are thousands out there still clamoring for her to be different, enough that Michelle's legacy will be that she was a "feminist nightmare"? As many have pointed out on Twitter, Cottle has a history of writing articles about frustration and feminism and the political realm. The inflammatory nature of these types of pieces doesn't preclude us from not discussing the things that the First Lady is doing in office and the message they send to the American public, but they should warn us against doing so in such a tired way. Image via Win McNamee/Getty Images.